Dont you sometimes wish you could be right in the middle of the action? The Virtual Football Trainer, developed by the Virtual Reality Laboratory at the College of Engineering, makes thatand morepossible. Thanks to the technology of immersive virtual reality, users feel as if theyre on the playing field in a sold-out Michigan Stadium, surrounded by full-size, moving players. They can experience the game from a specific players point of view, hover over the field or even fly from one end to the other and all the way up to the blimp circling above. The action really takes place in the CAVE (Cave Automatic Virtual Environment), a 10x10x10-foot, cube-shaped room in the Media Union. The floor and three walls of the CAVE serve as projection screens for computer-generated, stereoscopic images. Users don special glasses that render the images three-dimensional. In other projects, the CAVE has been used to create virtual prototypes of concept cars and automobile interiors, to help design the new terminal at Detroit Metropolitan Airport and to simulate the trauma bay of a hospital emergency department. 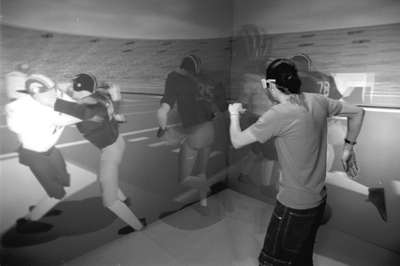 Engineering professor Peter Beier remembers meeting with football head coach Lloyd Carr to discuss the possibility of using virtual reality to train football players. At the time, the German-born Beier knew next to nothing about the game. With funding from the Graham Foundation, equipment from Silicon Graphics Inc. and lots of help from the football players and staff, Beier and a team of nine students and researchers spent about 10 months developing a pilot version of the Virtual Football Trainer. The point isnt to play an entire football game in a 10x10-foot box, but to train players to react quicklyand appropriatelyto situations theyre likely to encounter on the field. Training basically means repetition, repetition, repetition, Beier explains. Practicing on the field requires 22 players and is limited to 20 hours a week. The virtual trainer could give individual players additional time to hone their skills, going over and over plays as often as they want. To use the system, a coach first enters plays on a laptop computer, using a software program that creates two-dimensional play diagrams much like the old-fashioned chalkboard versions. Then the system automatically converts the symbols on the laptop screen into animated, three-dimensional football players in the CAVE, suited up in their teams uniforms, complete with numbers on their jerseys. During a training session, the trainee is in the CAVE wearing virtual reality goggles. Sitting at one side of the room, the coach controls the session from his laptop, calling up predefined plays and even changing plays on the fly. Beier, who now knows that a wishbone is not just something you find in your chicken dinner, says the Virtual Football Trainer was by far the most complicated and challenging project he has undertaken. One of the trickiest parts was making the virtual players movements seem realistic. Just like real players, virtual players have an internal skeleton made up of rigid bones and connecting joints that can move in specific ways. With all 22 players on the field and each player moving differently, we have a total of 1,200 parameters that change continuously, he notes. More information on the Virtual Football Trainer is available on the Web at www-VRL.umich.edu/project/football.